About 500,000 Americans get dental implants every year according to the American Academy of Implant Dentistry, making it one of the most common restorative procedures performed by dentists. If you’re a good candidate for this procedure, it should be your first choice to restore missing teeth. Get in touch with Dr. Richard Mark at his Independence, MO, office for an initial evaluation and to schedule your implantation appointment. Some of the common causes of tooth loss include sudden head injuries (knocked out teeth from playing sports, etc.) and the natural process of aging, which can cause bone loss. In some cases, patients have teeth that are loosening due to dental decay or gum disease, and those teeth may need to be extracted. Planning necessary dental procedures with your dentist will improve the chance that dental implants will help restore your smile. After a tooth is removed from its socket, there is room inside the bone tissue to hold a new device called a dental implant. To begin an implantation procedure, your Independence, MO dentist will make a small hole inside of healthy bone tissue and insert the implant. 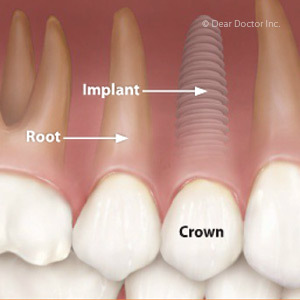 Once closed, the implant will eventually bind with the bone tissue and form a support for a permanent crown. 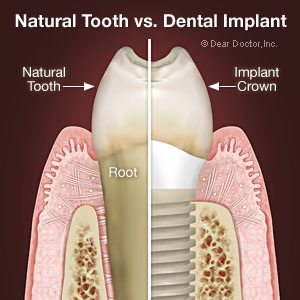 Dental implants restore dental function for chewing and cosmetic appeal for smiling. When you're confirmed as a candidate for dental implants, you should ideally opt for this procedure over dentures. If you wait too long to decide, the bone tissue in your jaw could degrade, removing the option for dental implantation. 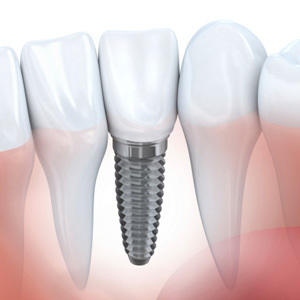 With an implant installed, you will continue to maintain healthy bone tissue. You’ll also have a dental replacement that is firmly placed and won’t shift when you’re eating or talking. You won’t have to worry about removing the device for cleaning or maintenance because it’s permanently affixed to your jawbone. 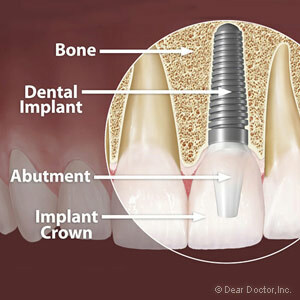 Dental implants work for patients who meet certain dental standards, so you’ll need to schedule an initial exam. Call (816) 461-3660 today to schedule your appointment with Dr. Richard Mark at his office in Independence, MO.